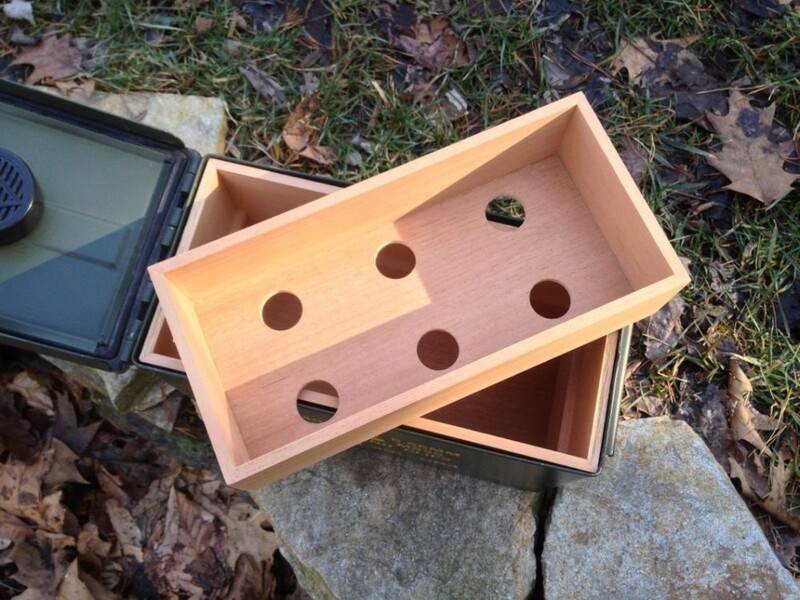 Fully assembled, handmade Spanish Cedar cigar humidor trays designed to fit in Ammodor ammo can cigar humidors. Will come with tray, two ledger strips of thin Spanish Cedar and a syringe of glue. The ledger strips MUST BE INSTALLED. Simply adhere them to the left and right short wall of your Ammodor using the provided glue. Then, your tray will rest on these cleats and be properly help in place. Trays are also available in DIY form. Our ready-to-assemble DIY trays include all the necessary pieces of Spanish Cedar that are pre-cut to exact size. They require sanding, assembly and finishing. Contact us prior to order to discuss fit in your existing Ammodor. If you’re placing an order for a new Ammodor, please use the “Add A Tray” option on the product page instead of this item. The tray itself is excellent! I purchased two tray for cans I did myself, and both trays fit perfect. The issue I had was 2/3 of the items said to be included were not. There were no wood strips included to be glued in as tray stops. Additionally, there was no glue included as the page says. Being crafty I utilized a cigar box I had for the ledger strips, and any lowes or Home Depot carries the correct glue. Thanks for the feedback Steven. My mistake for not including those items. Glad you were able to find a crafty bush fix. Please contact me next time so I can fix any issues like this for you. Thanks again for the business!